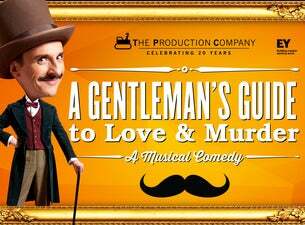 Don’t miss the Australian premiere of the Tony Award winning drop-dead musical comedy, A Gentleman’s Guide to Love & Murder. A Gentleman’s Guide to Love & Murder is the drop-dead, uproariously funny musical about Monty Navarro, a penniless clerk who discovers he is ninth in line to be Lord D’Ysquith, the Earl of Highhurst. But when the D’Ysquith family dismiss Monty’s claim, all eight family members in line to be Earl, surprisingly start dying from unnatural causes! This dastardly plot has been created to feature a single virtuoso performer in all eight roles; triple Helpmann Award winner Mitchell Butel stars in these eight roles. Between murders, Monty is trying to woo money-minded Sibella Hallward until he finds himself drawn to the young Phoebe D’Ysquith. How will all these convoluted storylines come together? This hilarious show enjoyed a three-year run on Broadway and in 2014 was nominated for 10 Tony Awards and won 4 including Best Musical. The score includes song titles A Warning to the Audience, I Don’t Understand the Poor, Poison in My Pocket, Better with a Man, Why Are All The D’Ysquiths Dying? and Looking Down The Barrel of a Gun!